2015 : Hamonic+Masson & Associés complete the first residential high rise of 50m to be built in Paris since the 1970s. Hamonic+Masson & Associés is Gaëlle Hamonic, Jean-Christophe Masson and, since 2014, Marie-Agnès de Bailliencourt. 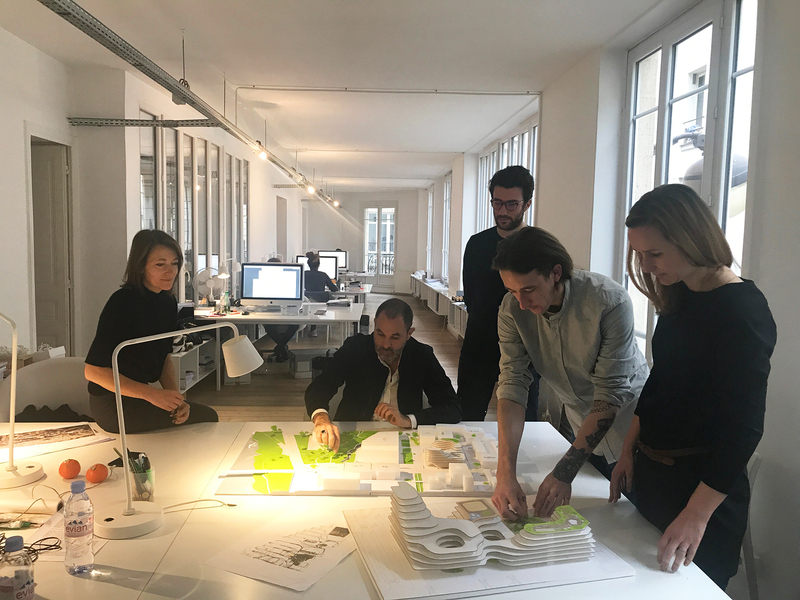 The practice was founded in 1997, was nominated for the Mies van der Rohe prize in 2001, and in 2002 was awarded the Nouveaux Albums de la Jeune Architecture (NAJA) by the French Minister of Culture and Communication. The firm became recognised by the general public in 2003 by designing the Maison Métal in Paris’ Parc de la Villette. It was an event that placed Hamonic+Masson at the crossroads of art and architecture, a flexible place that creates adventure. The office has since staged events such as co-curating the French Pavilion at the 2008 Venice Biennial, and has opened a series of exhibitions at venues such as the Cité de l’architecture & du patrimoine. Hamonic+Masson & Associés regularly participate in international conferences and lectures. Their work has been the subject of many publications and has featured in numerous exhibitions in France and internationally. Their projects have also been nominated for several prizes and awards in France and elsewhere. In 2012, the office received the “prix spécial AMO Saint-Gobain” for the construction of 62 social housing apartments on rue Villiot in Paris’ 12th arrondissement. The practice intervenes in all sectors including housing, public facilities, retail, offices, infrastructure and urban design in France and internationally. It is presently participating in the debate on height that has become controversial throughout France. In 2015 the practice completed Paris’ first housing project measuring 50m since the 1970s, in the city’s Masséna district. Projects in the framework of the Grand Paris are also currently being undertaken, notably the proposition for the Avenue Foch, which became one of the major projects backed by the Paris City Hall during Anne Hidalgo’s 2014 campaign for the Mayor of Paris.